Bubble & Balm may only be a year old, but their products are already making a splash at one of the UK’s top supermarkets! 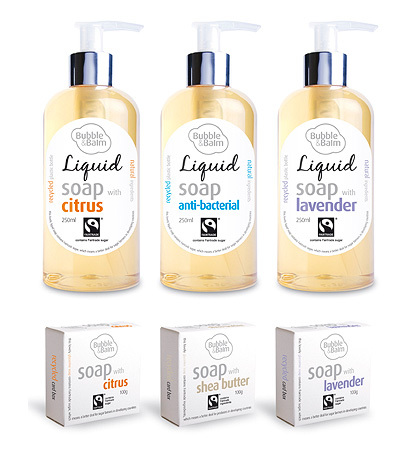 The range includes a selection of liquid and clear glycerine bar soaps that are the first natural soaps to carry the FAIRTRADE Mark in the UK. Available in Citrus or Lavender and made in the UK using traditional methods, each product is naturally formulated with plant and essential oils and enriched with glycerine to soothe and moisturise. The entire range is suitable for vegetarians to use and is free from parabens, sodium lauryl/laureth sulphate and phthalates. 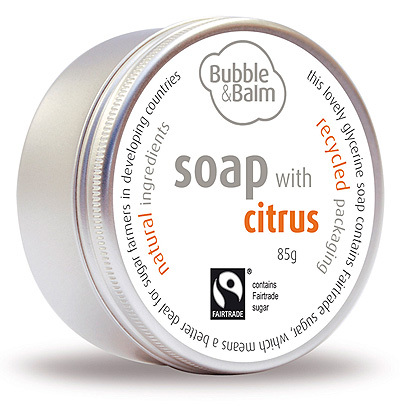 The luxury hand wash retails at £4.95, and the bar soaps – which are packaged in a watertight aluminium tin that doubles up as a soap dish are priced at £4.85 each. Have you spotted these whilst doing your weekly shop yet?